1. If we stop greenhouse gas emissions, won’t the climate naturally go back to the way it was before? 2. Isn’t there “warming in the pipeline” that will continue to heat up the planet no matter what we do? The correct answer to both questions is “no”. Global warming is not reversible but it is stoppable. Many people incorrectly assume that once we stop making greenhouse gas emissions, the CO2will be drawn out of the air, the old equilibrium will be re-established and the climate of the planet will go back to the way it used to be; just like the way the acid rain problem was solved once scrubbers were put on smoke stacks, or the way lead pollution disappeared once we changed to unleaded gasoline. This misinterpretation can lead to complacency about the need to act now. In fact, global warming is, on human timescales, here forever. The truth is that the damage we have done—and continue to do—to the climate system cannot be undone. The second question reveals a different kind of misunderstanding: many mistakenly believe that the climate system is going to send more warming our way no matter what we choose to do. Taken to an extreme, that viewpoint can lead to a fatalistic approach, in which efforts to mitigate climate change by cutting emissions are seen as futile: we should instead begin planning for adaptation or, worse, start deliberately intervening through geoengineering. But this is wrong. The inertia is not in the physics of the climate system, but rather in the human economy. This is explained in a recent paper in Science Magazine (2013, paywalled but freely accessiblehere, scroll down to “Publications, 2013”) by Damon Matthews and Susan Solomon: Irreversible Does Not Mean Unavoidable. Since the Industrial Revolution, CO2 from our burning of fossil fuels has been building up in the atmosphere. The concentration of CO2 is now approaching 400 parts per million (ppm), up from 280 ppm prior to 1800. If we were to stop all emissions immediately, the CO2 concentration would also start to decline immediately, with some of the gas continuing to be absorbed into the oceans and smaller amounts being taken up by carbon sinks on land. According to the models of the carbon cycle, the level of CO2 (the red line in Figure 1A) would have dropped to about 340ppm by 2300, approximately the same level as it was in 1980. In the next 300 years, therefore, nature will have recouped the last 30 years of our emissions. 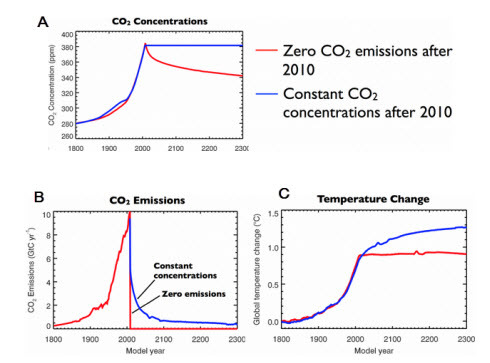 Figure 1 CO2 concentrations (A); CO2 emissions (B) ; and temperature change, for two scenarios: zero emissions after 2010 (red) and reduced emissions producing constant concentrations (blue). From a presentation by Damon Matthews, via Serendipity. So, does this mean that some of the climate change we have experienced so far would go into reverse, allowing, for example, the Arctic sea ice to freeze over again? Unfortunately, no. Today, because of the greenhouse gas build-up, there is more solar energy being trapped, which is warming the oceans, atmosphere, land and ice, a process that has been referred to as theEarth’s energy imbalance. The energy flow will continue to be out of balance until the Earth warms up enough so that the amount of energy leaving the Earth matches the amount coming in. It takes time for the Earth to heat up, particularly the oceans, where approximately 90% of the thermal energy ends up. It just so happens that the delayed heating from this thermal inertia balances almost exactly with the drop in CO2 concentrations, meaning the temperature of the Earth would stay approximately constant from the minute we stopped adding more CO2, as shown in Figure 1C. There is bad news and good news in this. The bad news is that, once we have caused some warming, we can’t go back, at least not without huge and probably unaffordable efforts to put the CO2 back into the ground, or by making risky interventions by scattering tons of sulphate particles into the upper atmosphere, to shade us from the Sun. The good news is that, once we stop emissions, further warming will immediately cease; we are not on an unstoppable path to oblivion. The future is not out of our hands. Global warming is stoppable, even if it is not reversible. Bringing human emissions to a dead stop, as shown by the red lines in Figure 1, is not a realistic option. This would put the entire world, all seven billion of us, into a new dark age and the human suffering would be unimaginable. For this reason, most climate models don’t even consider it as a viable scenario and, if they run the model at all, it is as a “what-if”. Even cutting back emissions severely enough to stabilize CO2 concentrations at a fixed level, as shown in the blue lines in Figure 1, would still require massive and rapid reductions in fossil fuel use. But, even this reduction would not be enough to stop future warming. For example, holding concentration levels steady at 380 ppm would lead to temperatures rising an additional 0.5 degrees C over the next two hundred years. This effect is often referred to as “warming in the pipeline”: extra warming that we can’t do anything to avoid. The most important distinction to grasp, though, is that the inertia is not inherent in the physics and chemistry of the planet’s climate system, but rather in our inability to change our behaviour rapidly enough. Figure 2 shows the average lifetimes of the equipment and infrastructure that we rely upon in the modern world. 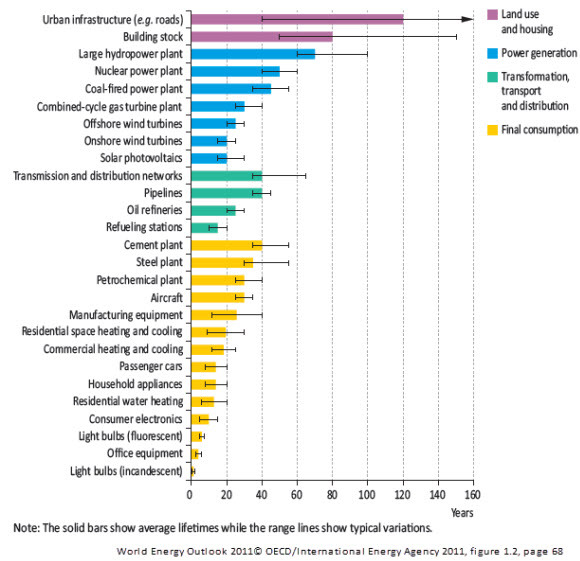 Cars last us up to 20 years; pipelines up to 50; coal-fired plants 60; our buildings and urban infrastructure a century. It takes time to change our ways, unless we discard working vehicles, power plants and buildings and immediately replace them with, electric cars, renewable energy plants and new, energy-efficient buildings. Figure 2 Average expected lifetimes for equipment and infrastructure. “Warming in the pipeline” is not, therefore, a very good metaphor to describe the natural climate system, if we could stop emissions, the warming would stop. However, when it comes to the decisions we are making to build new, carbon-intensive infrastructure, such as the Keystone XL pipeline, the expression is quite literally true. The Matthews and Solomon paper only deals with CO2. Short-lived greenhouse gases like methane are not considered in the study and nor are aerosols. Stopping fossil fuel burning, especially coal, would reduce aerosol (small particle) emissions, reducing their current shading effect and increasing warming. On the other hand, stopping fossil fuel consumption would decrease methane emissions and thus decrease warming even more than these authors have projected. It may turn out that these two effects balance out. The other potential problem is that the carbon cycle model that Matthews and Solomon use may not be as well behaved as they predict. For example, MacDougall et al (2012) ran their own “industrial shutdown” experiments and found that future CO2 concentrations in their most likely climate sensitivity case remained steady, because emissions from the permafrost (see this SkS post, Figure 3) balanced the reductions from other carbon sinks. This means that a shutdown of human emissions could, in practice, look more like the blue lines in Figure 1. The likelihood and severity of unexpected carbon-cycle feedbacks, including the way in which the ocean absorbs CO2, will be larger when there has been more warming—due to more emissions or higher climate sensitivities, or both—but this only increases the need for prompt and substantial action in reducing emissions. The warming we have caused by our emissions of carbon cannot be undone. The additional future warming we will experience will be a result of our current and future emissions. The inertia in the climate system is not natural, but human. Emissions avoided today mean less warming tomorrow, and forever. The confusion that many of us have with answering the two questions posed at the beginning of the article is probably rooted in our mental models, one being that the climate change will naturally revert back to normal; the other that the changes in the climate system have unstoppable momentum. Neither view is correct and they both favour inaction; one by implying that we can wait to fix the problem, the other by implying that it is already too late. Metaphors and mental models are essential to understanding the way complex systems work. But they can mislead as well as illuminate. Here are a couple of analogies that I have come up with, but they are not perfect either. Maybe readers can do better. We can’t put toothpaste back in the tube once we have accidentally squeezed too much out, but we can prevent any further waste by stopping squeezing. Like a bull in a china shop, we can’t unbreak what we have already broken, but once the rampaging stops, no more damage will be done. Other articles on the paper by Matthews and Solomon can be found at Climate Central(Andrew Freedman) and Serendipity (Steve Easterbrook). This entry was posted in Hard Science and tagged Carbon Cycle, Feedbacks, Mitigation. Bookmark the permalink. ← Terminology: Tar Sands or Oil Sands?